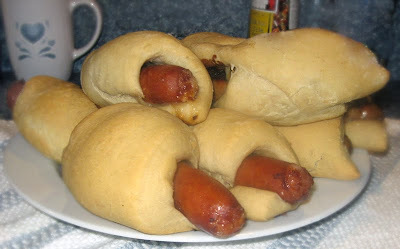 Oh wow pigs in a blanket, I forgot all about those tasty little guys. Inspired by the post, sausages wrapped in pizza dough, I started thinking. September = bread = dough… Italian and smoked sausage both with cheese in the freezer… Need to prepare both to feed everyone. How do I cook two different sausages and tie it together? Whole sausages wrapped in pizza dough. No, I just made pizza dough… Wait onion bread… That’s it onion dough! Add warm water to bread pan. Stir in dry onion soup mix. Add remaining ingredients in the order given. While the dough is rising, cook the Italian sausage. Whe sausage is done drain on paper towel and set aside. When cycle is complete turn off machine and let dough rest inside for 20 min. Divide dough in half. Roll half dough into a circle and cut diagonally into wedges. Roll sausage in dough starting from wide end of wedge to narrow. Place on lightly greased baking tray. Repeat process with remaining dough until all sausages are wrapped. Allow to dough to rise again. Bake in preheated 350 oven for about twenty minutes. Notes: I opened the oven door and set the tray on the edge of the stove top.The rise took about 15 minutes. This amount of dough was more than enough for 10 sausages. It would have been perfect for two packages of eight sausages or hot dogs. The guys said they were really fluffy and delicious. The onion flavor was just right. Any more would have been too much. Being a vegetarian I should be offended by that photo, but, you know, really, it's not that offensive. Can you make this with tofurkey dogs? Oh yes Mike, I would imagine you could. I am really hungry right now. Can you send me some of those. Nice presentation!